A change of focus for us at Ultra168 and we turn the spotlight on one of our own. Samantha Gash seems to achieved so much in such a short space of time. She recently joined the Ultra168 editorial board and is often seen popping up at races far and wide bringing us up to the minute coverage. Her biggest challenges are still to come and we are sure to hear in the not too distant future about another of these magnificent expeditions. What inspired you to take up ultra marathon running? In 2008, I completed my first marathon and although I was exhilarated to make it to the finish line I questioned whether I would have been able to complete it if I didn’t have a close friend to train with and do the entire race with. 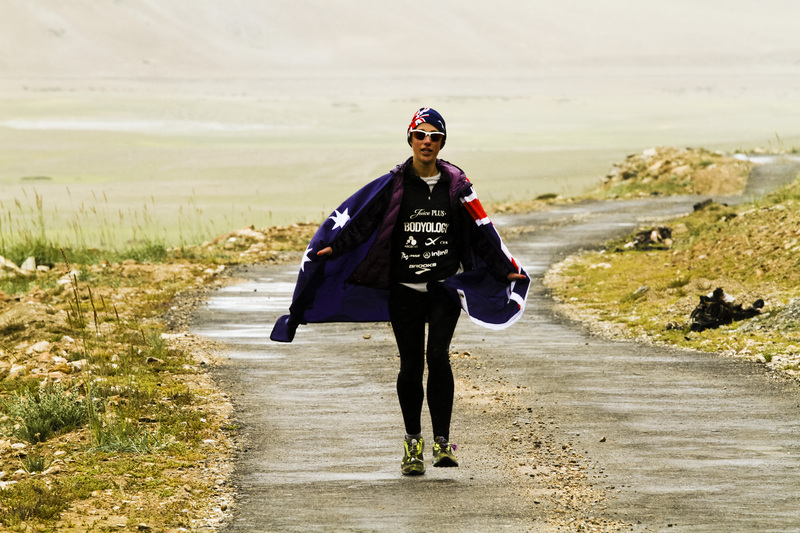 Shortly afterwards, I decided to enter my first ultra on the other side of the world where I knew no one, to test whether I could mentally and physically do something completely out of my comfort zone. How did you start? Did you run a marathon first? If so what sort of time did you do? In 2005 and 2008 I socially approached and completed the Oxfam Trailwalker in Melbourne. Building from my Oxfam base I trained pretty consistently for my first marathon in Melbourne finishing in 3.56. The following year I came back and knocked 20 minutes from my time which was based from experience and being paced by my speedy boyfriend more than from greater training. I get out of bed looking forward to do all the things in my life that excite me, or because my alarm is blaring and I have a ridiculously early training session. What is the source of your motivation? It is my inner belief that everyone has the ability to make a difference, whether big or small, and in whatever capacity. My coach Ben Griffin from Bodyology Performance Solutions prepares me! When I did the 4Deserts series in 2010, I had no idea how to prepare for an ultramarathon, and in the end it was more about getting to the starting line healthy and injury-free than strategic training. Since working with Ben I now thrive from the consistency and strategy in my training programs. Ben incorporates the typical long runs with speed and hill work, as well as altitude training. Are there differences between stage races and point to point ultras? Definitely. Each has their own set of challenges. I am more familiar with multi-stage racing and would suggest you have more opportunity and time to build into a stage race, particularly as the longer stage is towards the end of the race. I have watched people have some pretty shocking days and still rank highly based on their success in the other days. In contrast, in a single stage race if you have a bad day it is more likely to detrimentally affect your final performance. Another big challenge of multistage racing is carrying close to 20% of my bodyweight on my back; it demands different types of training and it certainly affects my natural running form. How much emphasis do you place on the mental aspects? Do you train your brain to overcome these challenges? If yes how? It’s a huge component to my preparation for an ultra event. I have been fortunate to race in some remote and unique locations in which the conditions are close to impossible to replicate in Australia. For that reason I not only create a range of mental challenges to make myself more prepared but I also rely heavily of visualisation – visualising the finish line as well as visualising all the different ways that I can imagine my resolve to finish may be questioned. What is you nutrition strategy? Is it different for women? If I am doing single stage races I tend to purely rely on Hammer Perpetuem and NUUN tablets for electrolytes. Nutrition becomes slightly more complex with multistage races in which my nutrition during the race consists of porridge and juice plus for breakfast, Perpetuem and an Ascend bar during the stage. Post stage an Ascend recovery shake & catalyst pills, ramen noodles and salt & vinegar chips. With the exception of the Juice Plus+ and Ascend the rest of the food isn’t at all what I eat on a day-to-day basis rather my diet generally consists of vegetables, fruit, tofu, lentils, grilled salmon and wholemeal pasta. Being a pescetarian and a female ultra runner it has made me a prime candidate for having low iron. After a big 2011 my iron levels were a little low and I am now taking Ferro-Grad C and increasing my Juice Plus+ for it to be absorbed more effectively. Do you feel women have an advantage or disadvantage to men in the ultra scene? I don’t normally like to generalise, but through my experiences I have found that females are more able to sustain a positive outlook throughout an ultra event. The field of females is normally a bit smaller than that of men. With a large number of competitors, many men normally start out too hard to compete which can hurt them later in the race. Because of the smaller number of females, I think we can be more focused on the big picture of competing to the best of our abilities. What is your approach to gear? Try before you race in it! What is your most important piece of gear on a stage race and why? My backpack!! It is the item that is shaped to your body and carries all of your gear. If it is too big or small it can cause chaffing. Also important for the bag is to have convenient pockets to access important items that you need during the race. Also have to stress the importance of my Injinji socks, which I wear during every run. What is you greatest achievement to date ? Tell us about the La Ultra? What was unique about that challenge? Oh boy this was an epic race for me – It is a 222km single stage race set in the Himalayas. It averages 4,500 metres and peaks at 6,000 metres. 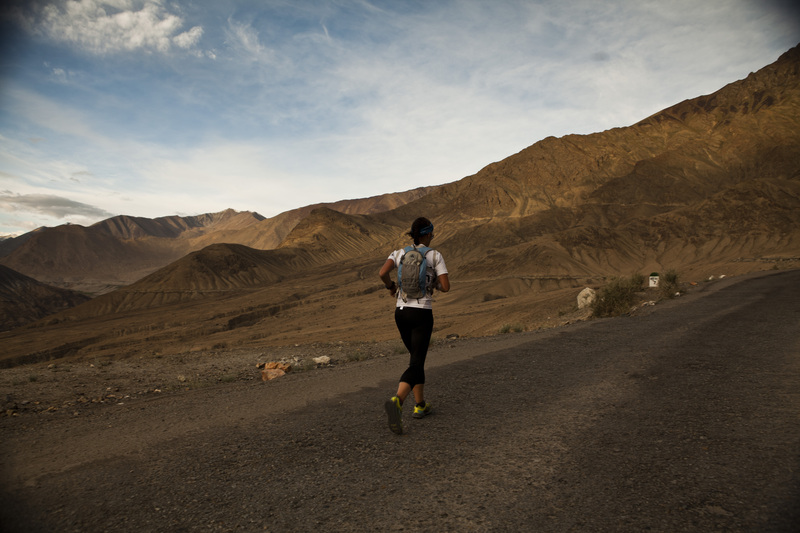 It required 10 days acclimatisation in Leh Ladakh with your crew before the race began. On top of that the temperature varied from scorching hot mid 40s in the valley to below freezing, blizzard-like conditions. 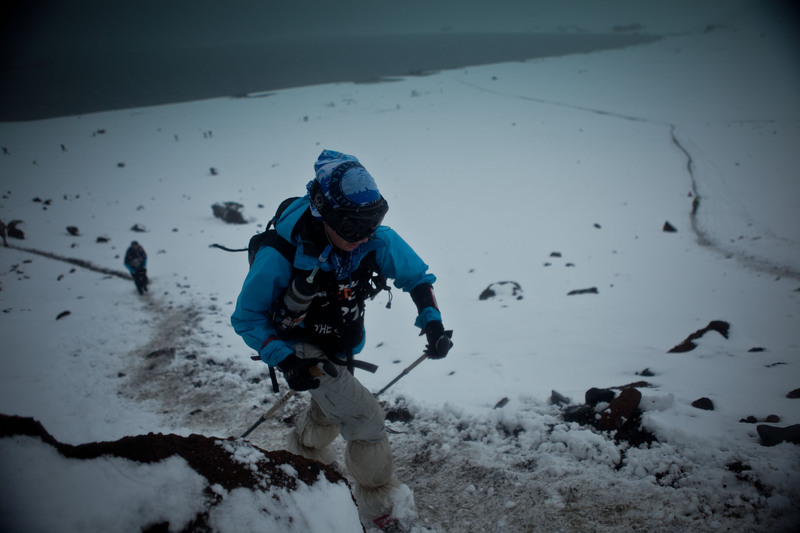 The weather became so unsafe as we made our way up the second mountain that our crew was forced to temporarily abandon the race for 6 hours before continuing. What was the hardest part of the 4 deserts? The entire year was consumed by racing overseas even though I was simultaneously trying to complete my law degree. I would have a few weeks after a race to recover and clear my mind from the last race, sit a few exams and then prepare mentally and physically for the next one. Each race was so different that I was never able to switch off from thinking of some component of the races. Most incredible sight you have seen out on the trails? Descending from Kardung La, the highest motorable pass in the world, during La Ultra. With the sun setting over the massive peaks around me, it is a moment I will never forget. Who else as an athlete inspires you and why? Ryan Sandes. I have raced with Ryan four times now and after getting to know him personally, I’m inspired by how hard he works as a sportsman and a businessman in order to make racing his career. How do you balance the day job with the running? What advice do you have? I start working as a graduate lawyer at Baker & McKenzie in March this year. My challenge to date has been combining several part time jobs (a researcher at Baker & McKenzie and public speaker), studying law, with training and racing within Australia and overseas. It is not an easy task and it comes down to being insanely organised and being committed to your running goals to make the training a priority. Tell us more about your community work and public speaking? My Mum would say that I have always been overcommitted. I have interests in a range of different areas – running, community work, public speaking, law, etc… I realised that in order to be able to continue pursuing them all at a relatively high standard it would be best to weave as many of my different passions into one pursuit. From the 4 Deserts, I was able to bring awareness and raise funds for cystic fibrosis, which my cousin deals with on a daily basis. From this point, I realised that ultra running is an amazing vehicle to create social awareness and change. To be honest it is this realisation that has fuelled me to continue running, more so than for the love of running itself. I have been fortunate to have the opportunity to present my experience extensively throughout the U.S. and Australia as well as in the UK and Malaysia. Where do you get your information from on ultra running ? Ultra168 website and I follow athletes and races through Twitter. Where do you train when in Oz? Locally, I run the Yarra trails and my longer runs tend to be in the Dandenongs. I’ve recently had three trips to the Vic Alps and the trails there are beautiful and challenging. What major goals are still to be kicked in 2012? I am pretty pumped about an expedition I will be doing in Australia this July. Currently I am in the early stages of preparing the logistics, my crew and researching non-profit projects I hope to raise money for. I am also an ambassador for Ray Zahab’s organisation Impossible to Possible (I2P). The values of I2P are directly aligned with mine, which makes this a great fit and I hope to become more involved as the year progresses. Ooooh so many – Western States, UTMB, Torres de Giants, Hardrock, Badwater and Leadville… just to name a few. What do you think gear manufacturers need to do to address female athletes? Being that I am under 5 ft, size has always been an issue for me, and I am sure many women on the shorter and of more petite size would have this difficulty as well. I feel manufacturers don’t cater to this size anywhere near enough and as more women take up ultra running, they can’t ignore this growing market. Brooks Cascadia! I got some horrid blisters during my first ultra while wearing a different brand. Since then, I have changed to the Cascadia, using each model from 4 thru 7, and have not any issues with blisters since. For shorter stuff, the “Wink” by Ultimate Direction is my best friend. Similar to the “Nathan”, it has a front vest, which fits all of my need to access gear for the race. It also fits a 2 litre bladder and if I pack well all of the mandatory gear for the Northburn and the Northface races. I am still seeking out the perfect multiday pack. The Salomon 20 liter, which I used in Nepal, is too big on my shoulders and bounces all over the shop. I am keen on trying the Salomon S Lab 12 (small). Are you a good navigator? Is this important in stage races? I am a terrible navigator. I still get lost on the Yarra trails, which I do multiple times a week. The staged races I have competed in are generally well marked and require little navigation as long as the local children don’t steal the markers. Will we see you attempt GNW100 miler this year? I am involved in an overseas running project towards the end of the year so as long as this doesn’t clash I would be pretty keen to do GNW100 this year. Due to my poor sense of direction I would like to train on the course as much as possible beforehand. Most inspiring leader and why? Ray Zahab from Impossible2Possible because he truly dedicates his life to educating and inspiring youth to first believe that anything is possible, and secondly the importance of active living and healthy nutrition. How much have you changed since your first ultra/multi stage race? What took you to the next level ? Doing the 4Deserts as my first introduction to ultra running provided the biggest learning curve. I learnt the importance of patience, flexibility, and the need for self-awareness while racing. When I competed in RTP’s Nepal race in November last year I noticed I was far more comfortable to push myself harder physically whilst simultaneously being more aware of the inherent dangers of ultra running. No doubt working with Bodyology and being consistent with my training has helped to take my running forward. What advice would you give to anyone wishing to emulate your feats? Believing in yourself, taking every little step to get yourself prepared and manage your time. Where can we see you next and what is it? You can next see me at the 6 foot track, reporting for Ultra 168 and doing a training run at the Northburn 100 in New Zealand, before heading back to the Blue Mountains to run with Daniel Trevena at the North Face 100. Apart from running what other training do you do? Bikram yoga, pilates, the occasional swim and bike ride. What do you do for rehab/recovery? Three things: (a) I take Ascend Recovery shakes and Ascend protein catalyst capsule religiously after every training session; (b) I wear CWX compression tights after long runs and especially during multistage races; and (c) I train in Bodyology’s altitude chamber which allows me to train hard whilst doing less mileage. Great article . So good to see so many trail runners starting to come from this great land of ours. Plus so many female runners pushing their boundaries. Good luck Samantha – at 5′ , that is a real Pocket Rocket. Looks like the GNW100 is starting to also show so much interest – each year the boundaries are changing and the runners getting more serious. Can’t wait. It is amazing what Samantha has achieved at such a young age. She has some very bold plans for later this year.